Restoring these mighty relics has been a passion of mine for over a decade. The radio that sparked my first interest was a large Philco console in my parent's basement in the mid 1990's. I was amazed by the glass tubes in the back and the numerous controls and push-buttons. Once the word got out, everyone had an "old radio" that they needed to dispose of, so who else to give it to than me. Lacking the necessary knowledge and resources, my interest in radio died down until one night in late 2000. While surfing the internet I came across a few vintage radio websites online. I then realized that there was indeed a great interested in this old technology out there and a whole new world was opened up for me. I have restored and owned well over one hundred radios since first entering this hobby. My collection of restored and project radios usually averages around 40 - 50 sets. Besides radio, I also collect miscellaneous radio memorabilia, radio/electronics books and manuals, and various antique electrical devices. I began my career in electricity being entirely self taught and learning by trial and error at a young age. I have attended several schools over the years over the years to further educate myself and advance my career. Schools include; Prosser School of Technology (Technical Certificate in Electricity), Ivy Tech Community College (A.A.S. Industrial Electricity), and Purdue University (B.S. Electrical Engineering Technology). My last career of nearly a decade was working as an electrician (commercial/industrial), I currently work as an electrical engineer for a major supplier of railroad signaling, controls, and engineering services. I became interested in electronics in 1991 (Left), and would later revive my interest in the early 2000's (Right). 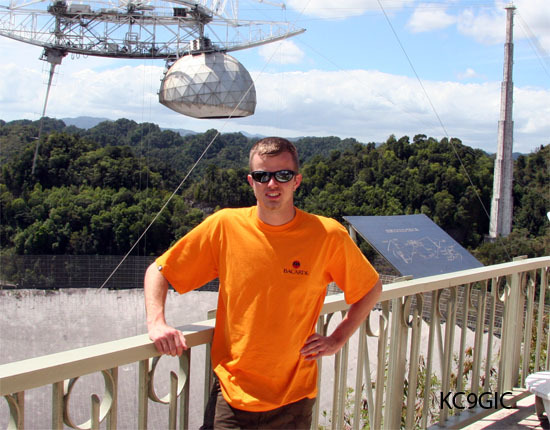 Arecibo Radio Observatory. Arecibo, Puerto Rico 2008. 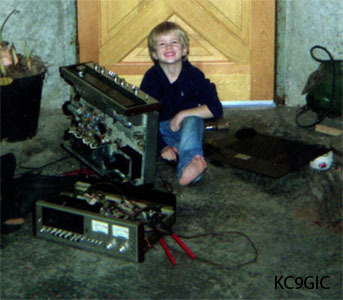 Besides my interest in antique radios, I am also a licensed amateur radio operator with a general class license and the call sign KC9GIC. Other hobbies include fishing, metal detecting, hiking, and camping. Over the years my collecting interest have varied from everything to only select radios. 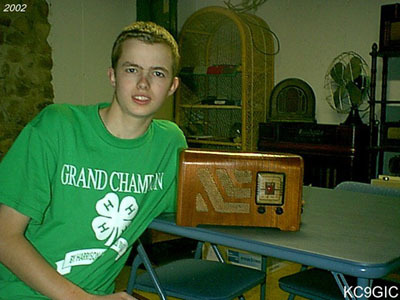 In late 2004, the decision was made to sell off undesirable radios and overall downsize my collection. I wanted to be able to show my collection to others and maintain a virtual gallery of my past and present radios, so this website came to life. Mozilla/Sea Monkey composer was used to write the html, and various other programs were used to edit photos and upload files. The older photos on here were taken with my badly outdated Polaroid PDC-640 camera. The 640 was replaced with a much more advanced Canon S1-IS, and the current camera used is a Canon EOS 350 Digital Rebel DSLR. This website was regularly updated for many years, but eventually fell into neglect as life was pulling me in different directions. In 2009, the host for this website, Geocites, ceased to exist so the move was made to "radiorestorer.com" with a new web-host. In summer of 2012, a new effort has been undertaken to fix this website and modernize the overall look.